Please note, this page is for instructions only. 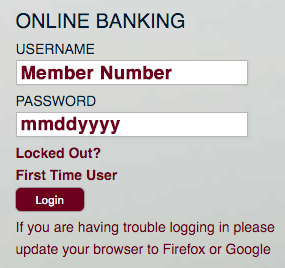 To log in to your account, click here to visit the Online Banking section of the homepage. As a first time user, you will use your member number as your username. Your password will be the prime member’s (person listed first on the account) date of birth in the mmddyyyy format, as shown below. To log in, return to our homepage.